There are 32 files totaling 1666KB in this category. Calculates the monthly payment of lease several payments are paid simultaneously at the beginning of the lease. Requires firmware 13441 or higher. Calculates loans with advanced payments (for example, a 60 month loan with 3 advance payments), giving the monthly payment (less the advance) and calculating the monthly and annual yield (rate). Also calculates the payment of a loan with residual value (for payment and yield, with the IRR method). Calculates an amortization schedule for loans, given the interest rate, the amount borrowed, and the duration of the loan. Calculates the fees for a mortgage as percentile "points" %, fix amount or both. Benchmarks how fast your Prime is (or the computer/phone simulating it). For reference, a revision A or C Prime should get 23.2 seconds, 25.5 seconds, and 245.4 seconds, and a revision D (G2) Prime should get 7.7 seconds, 8.5 seconds, and 87.4 seconds. The virtual calculator on a 2015-vintage computer should get 0.6 seconds, 0.7 seconds, and 4.1 seconds. Calculates price and yield of a Bond. The program treat bonds with coupons paid annually or semi-annually (or other ends) and also "zero bonds", both for "actual year" and "financial year" (30/360). Two programs to tackle common financial questions of purchasing automobiles, or other equipment that might be financed. CARPMT calculates what would be the monthly payment, while CARAFFORD calculates the sticker price that the buyer can afford. 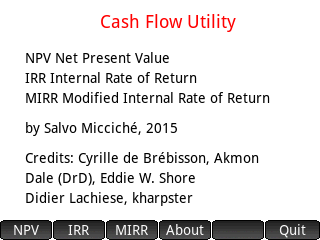 Calculate cash flow operations (IRR, MIRR, NPV). 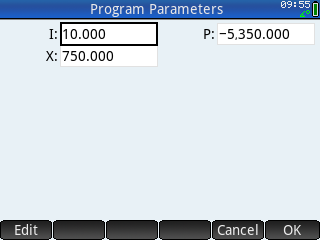 The program is presented in two versions: the first gives three routines to calculate (Net Present Value, Internal Rate of Return and Modified Internal Rate of Return, like that in the HP 12C); the second has a menu-based interface with only one command, Cash_Flow, that runs the same routines internally. An investor has several projects, each with their own initial investments and discount rate. 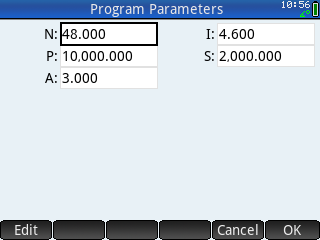 The net present value is calculated (NPV) for each project. If the investor combines all the projects into one set of cash flows, this program calculates the effective internal rate of return. 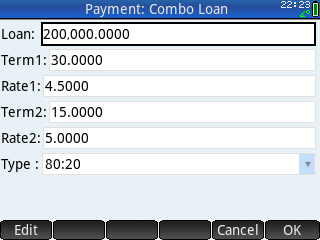 Calculates the payments for both separate loans and combined loans. This particular loan covers of three types: 80:20, 80:15:5, and 80:10:10. Loads and parses CSV files and strings. Calculates the depreciation of an asset with the methods of SL (straight line), DB (declining balance) and SOYD (Sum of the Year Digits), giving cost of fixed asset, residual value (salvage v.) and useful life of asset (years). 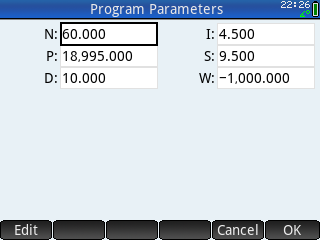 The program exports tables of depreciation as matrices: D_SLmat, D_DBmat, D_SOYDmat, and (for DB method) the "full end rate", D_DBendRate. Calculates the effective and nominal interest rate (both finite and compound). Uses the Fick cardiac output equations to calculate CO (Cardiac Output in L/min), SV (Stroke Volume in ml), CI (Cardiac Index in L/(min/m^2)), and SI (Stroke Index in ml/m^2) given the inputs Ca (Arterial blood oxygen (O2) content percentage), CvO2 (Venous blood oxygen (O2) content percentage), VO2 (Oxygen compulsion (in ml per pure oxygen gas per minute, STPD)), HR (Heart Rate in beats per minute), height in cm, and weight in kg. Implements an accessibilty resource for the deaf and visually impaired, using AFiles. Fingerspelling graphics must be provided by the user (One per character). Calculates the payment schedule of a graduated mortgage. A graduated payment mortgage (GPM) is a mortgage option that allows home buyers, particularly young, first-time home buyers, to purchase a home. The payments increase by a set percentage of at annual rate for several years until it reaches a plateau. Proof of concept of an HP-41C emulator, but I can't figure out how to make it work. Sets the Prime into the appropriate exam mode for International Baccalaureate (IB) exam use. Sample program to calculate the BMI (Body mass index), showing figures of the characters of the Simpsons for each weight range. Calculates how many payments are required to finish a loan, given a certain annual interest rate and payment. Payments are assumed to be monthly, and end of period. The program will also return the last payment. Due to the rounding in the financial algorithms, the last payment is an approximate (unless the interest rate is 0%). 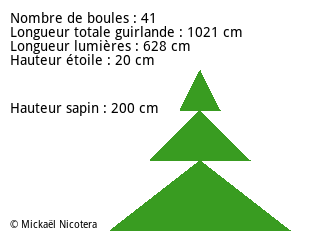 Performs common calculations related to putting up a Christmas tree. 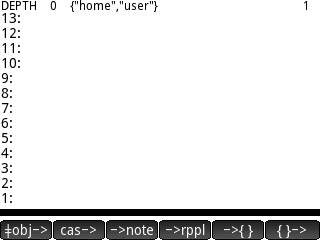 An early alpha release of a full RPL environment that runs on the Prime. The goal is to emulate the RPL functionality of the 48/49/50, while reusing as much of the existing Prime environment as possible. A workaround to allow reading and writing back to multiple stack locations from PPL via a key definition. Calculates simple interest (with inverse formulas) both for actual year and financial year (365 or 360 days). 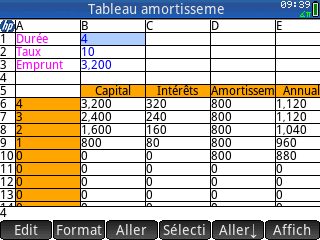 It can even calculate a difference between two dates and use it (as n) to calculate interest. Calculates time value of money for a loan with an "odd period" after the first payment. It calculates payment or rate (APR, Europe: TAEG) and interest for the days in the odd period, inputting the number of days or calculating a difference between two dates. Converts the differents units of length used in CSS3. Converts between px, em, % and pt. 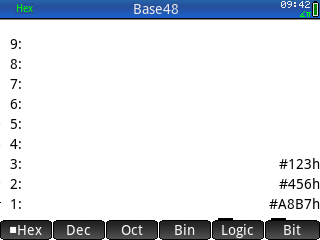 An early attempt at an improved text editor that adds search functionality.